Brian Wilson, who lives in Sidney, BC, Canada, has carried recycling to new heights in his current layout. 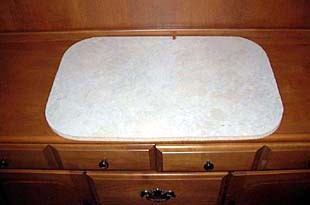 In Brian’s own words: “As my basebaord I’m using a kitchen sink cutout left over after kitchen renovations [above left]. Since this is my first attempt at a micro, I decided to keep it as simple as possible (KISS principle!). 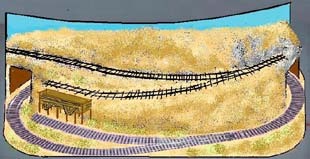 “I have used standard Peco switches and track for both the lower On30 portion [above right] and the upper On18 portion — with the only grade being on the upper level to bring the On18 track down to the ore bin. I haven’t included any other structures at this time, again in the interest of simplicity. I think, however, I will make the upper level and divider removable as a lift-out so that I will be able to swap different themes and scenery in the future. Brian’s delightful computer sketches of the finished layout’s appearance are shown below — one view from each side of the layout. The photo at right turned up the other day in an old scrapbook that I hadn’t looked at in years. 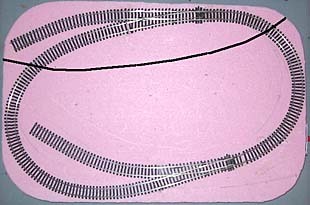 It shows a virtually prehistoric layout that I made in the early 1960’s — a 1:32n20 “hillclimber” layout. The scale is 3/8″ to the foot, and the gauge is HO (16.5mm). 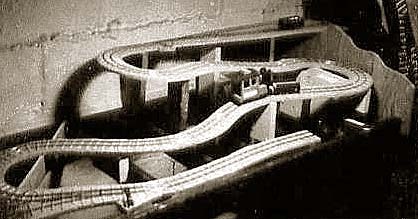 The operating plan was simple — the loco hauled the freight from the upper level down to the spur at the bottom right, then reversed and shoved the cars into the interchange yard (off camera to the left). Track is hand-laid and stock is all scratchbuilt or converted from standard HO stuff. Wish I could find a photo of the finished layout. My guess is that I never got around to finishing it! This quick sketch shows an expansion of one of my favorite plans from the Micro Layout Design Gallery, called Ha’Penny Mining Co. The original design is 30″x18″, but a reader asked how it would look if it were stretched out to 60″ — double the width. The above sketch was my sugestion. He came up with a similar design and has begun construction — with luck, we’ll have some photos of the finished layout in due course. This “stretched” version, called Tuppence Mining Co., provides for a nice-sized interchange yard and runaround at the bottom level, and a long, steady uphill climb to the mine. To add some spice to operations, you might want to install a passing loop (siding) midway up the hill (without interrupting the climb, of course! ), and that is indicated with dashed lines. Two trains, heading in opposite directions, can meet and pass here — with the uphill train having the right of way! This is an On30 or On18 plan, which could be built in Gn15 or HOn30 as well. Minimum radius as shown is 6 inches. This design illustrates the well-known fact that a good plan can be made even better if additional space is available!